Give Me Just A Couple Minutes Of Your Time… And I Guarantee You Will NEVER Write For Peanuts Again. It’s a fact. And if you’re like most freelancers, you’ll have your stretches of inspiration where words flow freely, creativity burns bright, a couple queries hit pay dirt… and then you’ll have your longer stretches where you can’t buy a break, and you’re left wondering why you work so hard for ten bucks here, ten bucks there… knowing if you hauled off and landed a minimum wage job you’d be living on the fat of the land compared to measly income you’re commanding now. Now, the interesting thing is… it’s NOT your fault. It’s certainly not because you’re a “bad writer”. It’s because you haven’t yet discovered the secrets of consistently earning market-value for your writing. If you just stay with me for a moment, I’ll show you how to never write for small change again. Ever. Awhile ago I stumbled upon a writing insider. His advice changed my view of the writing life and can change the level of your bank account… almost overnight. As president of Filbert Publishing, I spend my days uncovering amazing “insider” information — tactics, secrets and advice you can instantly use to make a better living as a writer. One of the reasons I do it is because this writing “insider” revealed some truly stunning secrets that immediately added a big influx of cash to my income. His advice changed my view of the writing life. I thought everybody knew these secrets… but when I discovered that a whopping 84 percent of all freelance writers earn a wage well below the poverty line, I decided I had to come forward and spill the beans. So, I decided to let you and a few other writers “in” on some of these secrets I’d learned. That’s how Writing Etc. started. You see… most writers who come to Filbert Publishing want to not only squeak by, earning a living wage, they want to live the “writers life.” You know what I’m talking about. They want to live the life of their dreams… sit along the Seine River in Paris debating philosophy with the next Ernest Hemingway…feel the hot Caribbean sun on their shoulders as they type their latest novel… trudge through the Amazon forest in search of their latest interview subject… insert your own dream here…. If you’re like me, you love to write. It’s fulfilling, and it wins you instant respect. But I also love earning a living wage. You know — cashing serious checks without investing huge amounts of time into a writing project. You won’t earn the Pulitzer Prize for Literature writing some of these projects… but at the end of every day, it’s definitely possible to collect large, consistent, paychecks working on interesting and gratifying projects that easily fund the projects you’ve always dreamed of writing. No Queries. No Complex Proposals. It’s even possible to earn the income you deserve if you live in the middle of no-where, whether you’re a high-spirited extrovert or an “I’ll die if I make a cold call” introvert (like me). Because, as all successful freelancers know, and almost NO amateur likes to realize… there really are hidden markets and secret techniques you can immediately utilize to ratchet your income steadily upward. So here’s the deal: After much sifting, researching, and investigating, I pooled together some of the best High Profit Writing information that has crossed my desk these past years and gathered it together in an easy-to-read, simple to understand, even simpler to implement action plan. So, what kind of information are we talking about? Technique #12 will not only propel your income skyward, it’s a promo technique that PAYS you cold, hard cash. Technique #16 will land you prime real estate in magazines and newspapers for zero dollars. None. Zip. Nada. Want to easily harness the incredible power of the the Internet? Check out technique # 31. If you want the hands-down most powerful assignment-landing tool available today (and this tool is absolutely free, by the way) be sure to check out technique #34. How just one activity can boost your credibility to levels you couldn’t even imagine. Why the biggest scam ever promoted by the writing community will utterly tank your potential and leave you in the poor house. Technique #112 is essential to this biz. Absolutely essential. Best of all… these secret skills will stay with you for the rest of your writing life! They’ll continue to cultivate your income for as long as you choose use them. The best part of taking the time to master these High-Profit writing secrets? No commute. You can write in the comfort of your home. You set your own hours. Got an appointment? No problem. You’re free to leave your office any time you want. Office politics? Forget it. 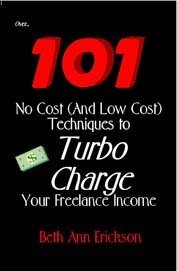 As a high profit freelance writer, you work with the people you choose to work with. What you are about to discover are the secrets of DOMINATING your (so-called) writing competition and earn an income many physicians would envy. The way I put this information together… you’ll cut years off your learning curve. You just read these secret strategies, implement them into your marketing program (or use them to begin a marketing program) and then watch the writing assignments flow in. And that’s just about ALL you need to do. Land even one assignment as a result of the techniques you’re about to discover and you’ll pay for this tiny investment many times over. Now you can download the e-version of this title for your Kindle for pennies on the dollar. Just click the appropriate link and you’re on your way.